The R-PLEX Human SCF Antibody Set includes a matched capture and detection antibody pair and calibrator for the quick and easy measurement of SCF in biological samples. R-PLEX products leverage MSD’s electrochemiluminescence technology for better sensitivity and a larger dynamic range than traditional ELISAs. R-PLEX matched antibody sets enable the development of singleplex and multiplex immunoassays. Individual assays may be developed using MSD avidin- or streptavidin-coated plates. Custom multiplex assays with any combination of R-PLEX analytes, as well as R-PLEX plus U-PLEX analytes can be developed on U-PLEX MULTI-SPOT plates. To learn more about the advantages of R-PLEX products click here. 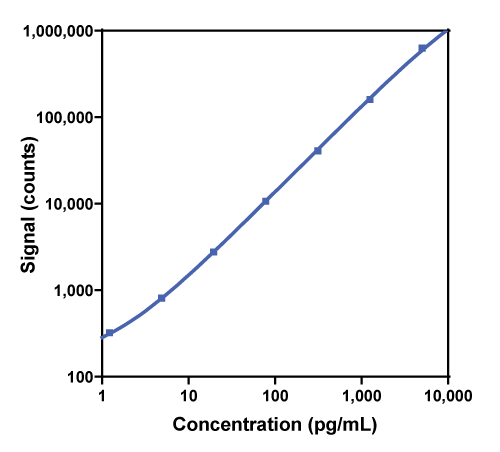 Calibration curve for the R-PLEX Human SCF Antibody Set was assessed and representative data is presented below. Description - Stem cell factor (SCF, Kit Ligand, KL, Mast Cell Growth Factor, MGF, C-Kit Ligand, sKITLG, KITLG), is a hematopoietic cytokine and a ligand for the tyrosine kinase receptor, c-Kit. It is normally found in both soluble and transmembrane forms. SCF and its receptor c-kit have been implicated to play a role in hematopoiesis and the development of germ cells and melanocytes. SCF is produced in the transmembrane as well as soluble forms by endothelial cells and fibroblasts. The different forms of SCF are generated by alternative splicing and both the soluble and the transmembrane form of SCF are biologically active. SCF has been associated with asthma, and myocardial infarction and cardiac repair.